The weekly Shabbat dinners at Chabad provide Jewish students — from the freshman to the post graduate — an intimate and elegant setting to eat, meet new friends from every niche of the campus, and celebrate Shabbat in a warm and enjoyable manner. Students, bring your parents to your home away from home for a Shabbat Dinner and show them what you've been raving about! There is no charge for Shabbat dinner. You are welcome to make a donation. 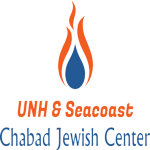 Please RSVP by emailing Rabbi@ChabadUNH.com or call 603-205-6598.